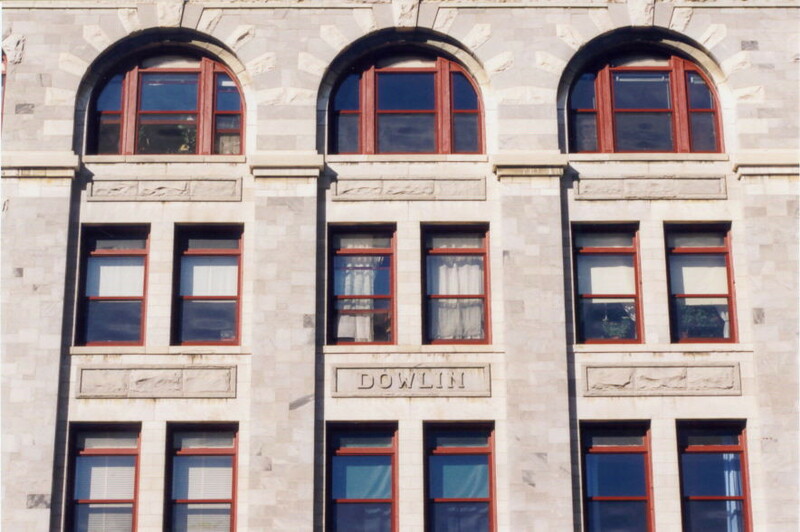 Dowlin Block, 1911. Courtesy of North Adams Historical Society. The year this photograph was taken (1911), Jason Braman and his wife Theresa moved into apartment 616, on the top floor of the Dowlin Block, a six-story building which has now been a fixture in North Adams since 1902. About 37 at the time, Jason was working as a clerk at the North Adams Wholesale Company. In his idle moments at the office, or when he peered out at the mountains from his apartment window, he might have dreamed of a better life in some far away city. But he could not have imagined that his face would one day become one of the most viewed images in American art. In 2014, the rear section of the Dowlin Block, 20,000 square feet, will be demolished, and Mr. and Mrs. Braman’s apartment will become a pile of bricks and sticks. When I heard about that, I decided to examine the history of this beautiful and artfully constructed building, and the plans for remodeling it. But more importantly, I wanted to peer into the lives of some of the persons that resided or worked behind its Romanesque windows, or had some other connection to the building. So I poured through the North Adams directories and early 1900 censuses, and picked out a few names. Then I started tracking down their stories, using the digital archives of the North Adams Transcript and several other newspapers; and birth, marriage and death records. The first people I had some success with were Jason and Theresa Braman. 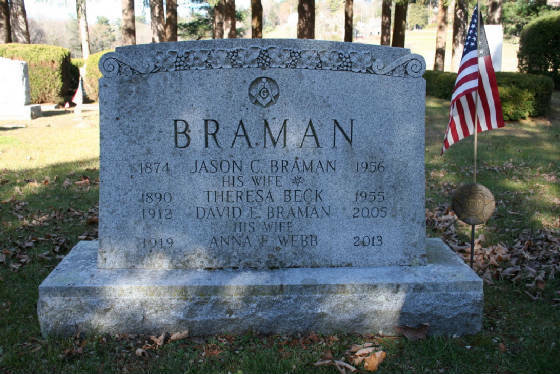 Jason Cary Braman was born in North Adams on August 1, 1874, the son of George Otis Braman (an insurance agent) and Lydia (Cary) Braman. When he was six years old, he was the only person named Jason living in North Adams. In the middle 1890s, he worked at Braman’s grocery store, which was owned by his uncle. He married Theresa Beck on April 21, 1909. She was born in 1883, in Wappingers Falls, New York, the daughter of David and Mary Beck. The family moved to North Adams in about 1895. David was a printer at Windsor Print Works. Theresa worked at Arnold Print Works for a few years before she married Jason. At the time, Jason had been working 10 years in the cloak and suit department at Tuttle & Bryant, a North Adams dry goods store. Jason is hired at Tuttle & Bryant’s. North Adams Transcript, April 17, 1899. Jason and Theresa lived in the Dowlin only two years, and then moved to 236 Eagle Street. In 1913, Jason started working for the J.F. Collins Tobacco store on State Street, famous at the time for “Lulu,” a female wooden Indian that stood in front. Their first child, David, was born in 1912. Three years later, their second child, Jason Cary Braman Jr., was born, but he died three months later. Jason had already left his job at Collins and was the manager of F. E. Braman & Company, a five and dime store at 57 Main Street, owned by his cousin Frank Braman. 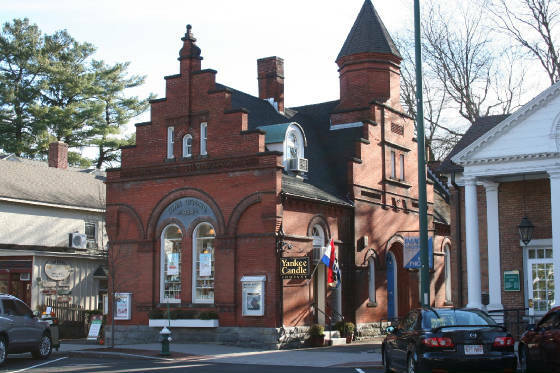 In 1927, the family moved to Stockbridge, Massachusetts, where Jason opened a dry goods store on the town’s now-legendary Main Street. He retired after running the store for 31 years. From the 1929 Stockbridge Directory. Location of former Braman’s Shop. Photo by Joe Manning, 2013. In 1955, Jason, then 81 years old, was asked by a local artist and illustrator to be a model for a magazine cover. 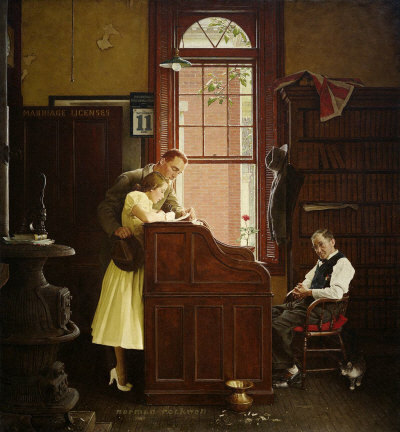 The artist was Norman Rockwell, the magazine was the Saturday Evening Post, and the painting was soon to be named The Marriage License. It was published on June 11, 1955, and would become one of the artist’s most beloved works. Jason died 18 months later, on December 26, 1956, at the age of 82. Theresa had passed away a year earlier. His son David worked at his father’s store for many years, and later served for 20 years as the postmaster in Stockbridge. David’s wife Anna worked for the Berkshire Garden Center and the Red Lion Inn. David died in 2005, and Anna died in 2013. They had no children. Both also modeled for Rockwell. Copyright ©1955, Saturday Evening Post & Curtis Publishing Co.(Jason Braman is the clerk on the right). Stockbridge Cemetery. Photo by Joe Manning, 2013. With such an auspicious start, I couldn’t wait to pick out a few more names from the early 1900s, and see what I could come up with. Though I didn’t find anyone whose picture is hanging in a museum, I found some interesting and diverse stories about people that should be remembered. I also interviewed a woman that had a business in the Dowlin for almost 60 years. But before we read about them, let’s learn more about the Dowlin Block, the man who built it, and the architect. Contrary to what most locals seem to think, it is not the “Dowling” Block. The correct name is on the building. Dowlin Block. Photo by Joe Manning, 1999. In 1895, North Adams was in the middle of an impressive growth spurt. Twenty years earlier, the five-mile-long Hoosac Tunnel had been completed, allowing trains to travel from Boston to North Adams and beyond by going across the northern border of Massachusetts and through the mountain just east of the city. Prior to that, trains had to go south and through Springfield, a much longer journey. This facilitated the expansion of manufacturing industries in the city. One of them was Arnold Print Works, which by 1900, was the largest printer of cloth in the world, employing over 3000 people. The city’s population spiked to 24,000, a number never to be surpassed. Also in 1895, North Adams became a city, with a mayor/city council form of government. They elected Albert C. Houghton, the president of Arnold Print Works, as its first mayor. 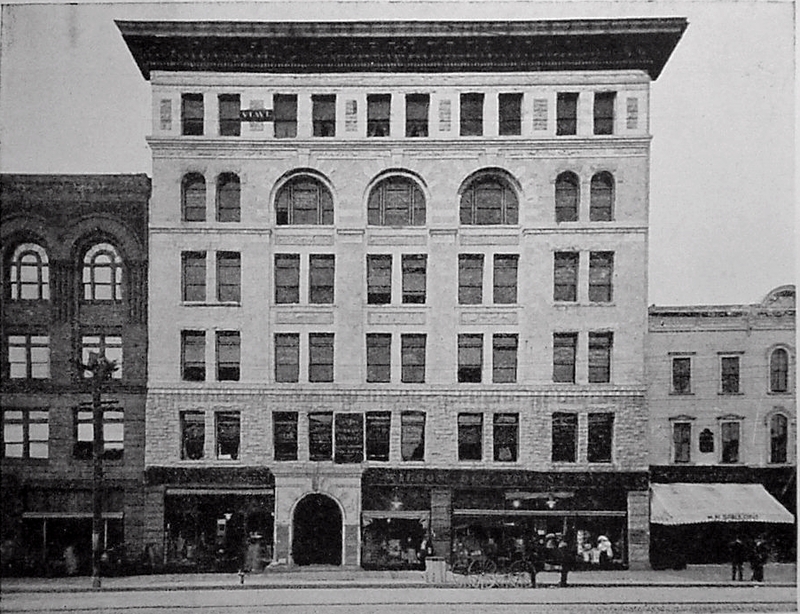 In the early 1890s, with an increasing need for more retail, office and residential space downtown, two large structures were built on the north side of Main Street: the towering and decorative Hoosac Savings Bank building, at 93 Main Street, and the Blackinton Block (referred to correctly by local historians as the Second Blackinton Block) at the corner of Main and Holden Streets. In 1902, two even larger buildings were erected: the New Kimbell Building, at 85 Main Street; and the Dowlin Block, at 101-107 Main Street. Photo by Joe Manning, 1996. (Left to right): Second Blackinton Block, Gatslick Block, New Kimbell Building, Hoosac Saving Back building, Dowlin Block. Photo taken from the loading dock of the North Adams Post Office. The Dowlin Block was built by Fred Forest Dowlin, a prominent attorney and real estate developer. Prior to the building’s construction, the property was occupied by a house owned by the Babbitt family, and by several retail stores in what was called the Adams Block, which included a furniture store owned by Jasper Adams, a five and dime store owned by A. 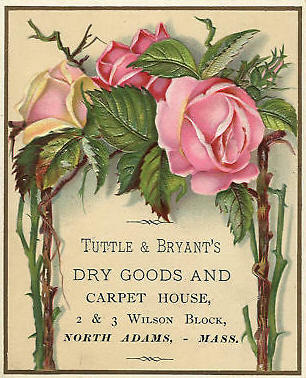 A. Hughes, and a carpet and drapery store owned by the Valentine Brothers. North Adams Transcript, June 13, 1901. Articles in the North Adams Transcript indicate that the Dowlin Block opened for business in late July or early August of 1902. A classified ad in 1903 indicates that apartments had a private bath and toilet, hot and cold water, and the building had an elevator and janitorial service. According to the 1903 North Adams Directory, 23 apartments were occupied by residents, and sixteen units and storefronts were occupied by businesses or offices. 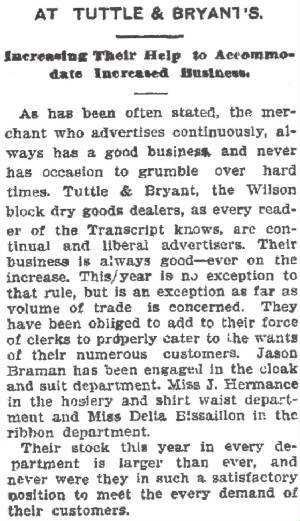 North Adams Transcript, August 25, 1902.